Devoid Of Culture And Indifferent To The Arts: More hooch: Gingersnap Liqueur, never before seen! 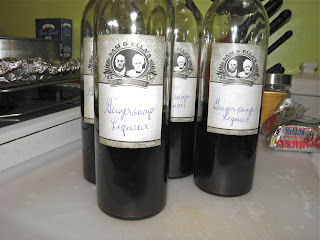 More hooch: Gingersnap Liqueur, never before seen! What if you could instil the essence of a gingersnap cookie into a liqueur? Sounds daunting, doesn’t it? Well it wasn’t really, and I have pulled it off! This liqueur tastes so much like the cookie it’s amazing. As you can see by the pictures, I only filled the bottles up halfway. No, it isn’t because I am cheap. There’s a method to my madness. At Christmas I will tie a note to the top of each bottle with instructions to fill the rest of the bottle with coffee or cereal cream and shake. 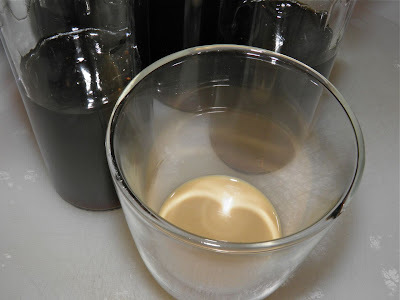 I can’t do it beforehand because the shelf life of refrigerated homemade cream liqueurs is not much more than a week. Of course, they can opt to not add the cream. I can see this liqueur being stunning in a gingersnap martini, or perhaps as a mixed drink booster with club soda. I would avoid using fruit juice with this like the plague. This liqueur is my own creation. You won’t find this recipe posted anywhere else, at least not yet anyway… I hope that you try it. It’s really one of the best liqueurs I’ve ever made. file for free here. They say "Sam & Ella's Cookin' School." Combine all the ingredients except for the vodka in a saucepan. Bring to a boil and keep at that heat for 5 minutes. Let the mixture cool and then add it, with the vodka to a Mason jar. Seal the infusion and let steep for 2 weeks, shaking occasionally. After the 2 weeks, strain through a fine sieve and bottle. Makes 4 375 ml bottles, filled half-way. Hi! I just found your blog and am in love! Totally trying the baklava liquor. Right now I'm working on a lavender liquor. How about a chocolate praline liquor with pecans, brown sugar and chocolate to add to your baking-inspired collection of alcohol?! I've tried chocolate before and it didn't turn out very well and I don't want to resort to chocolate essence... The purist in me. I'm still looking for a good base recipe. Once I do I'll look into praline! Sounds like a grand idea. Thank you! Hey. looks good, but if one wanted to make a long lasting version could you top up the rest with water do you think? 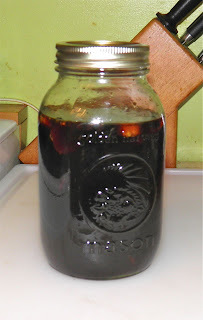 Hi, to make "full" bottles you should make a simple syrup of 1 cup sugar to 1 cup water. Boil for 5 minutes and mix in just before bottling. Alright, thank you very much that helps a lot. Hey! this sounds amazing, do you think it would work with brandy as the base? Sure. It will be sweeter I would imagine, because brandy is "sweeter". Let me know how it goes!